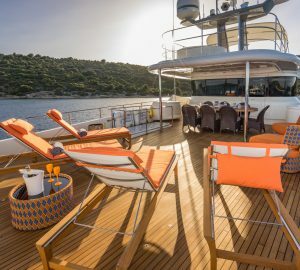 Beautiful motor yacht IMPROMPTU (hull T055) is a 49.99m semi-displacement vessel built in aluminium by Trinity Yachts and launched in 2010, with a refit in 2016. 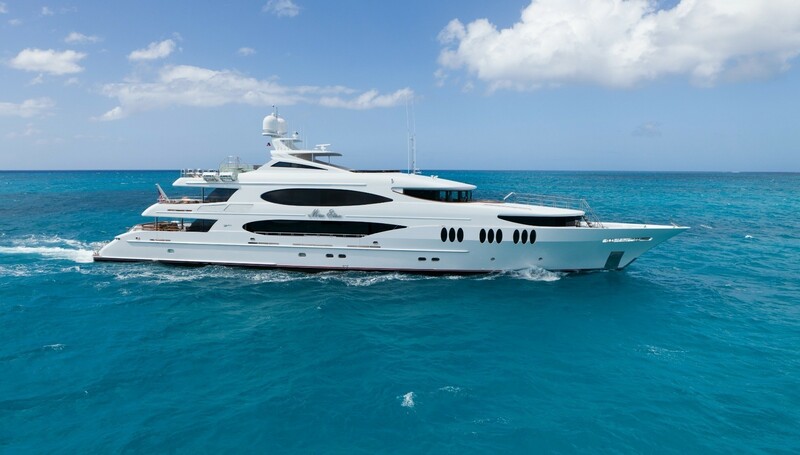 IMPROMPTU superyacht features a refined and contemporary styling by renowned Patrick Knowles and a sophisticated exterior by Trinity's in-house design team. 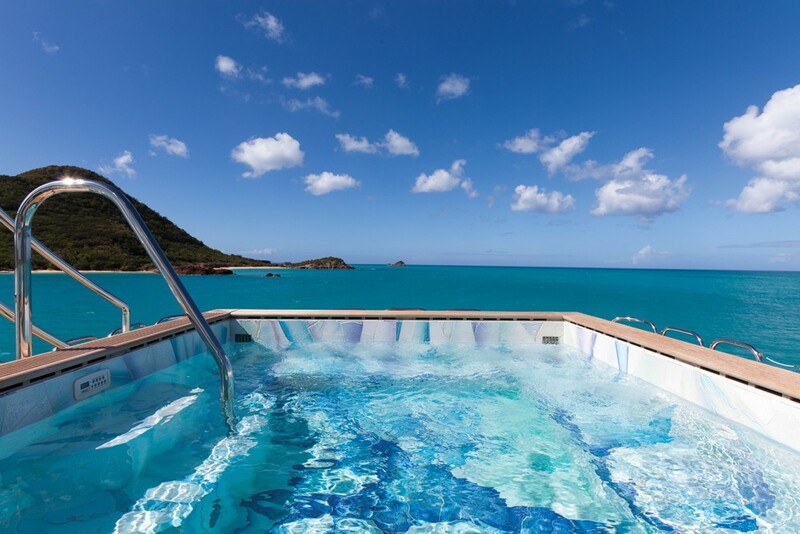 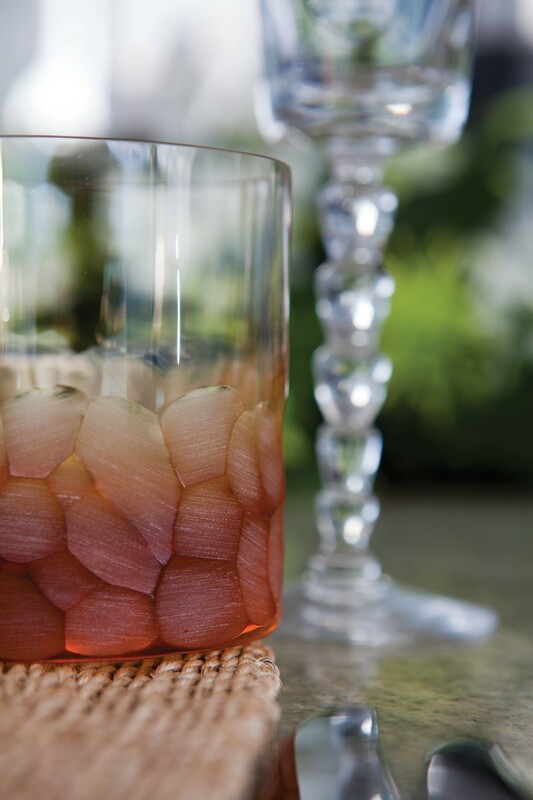 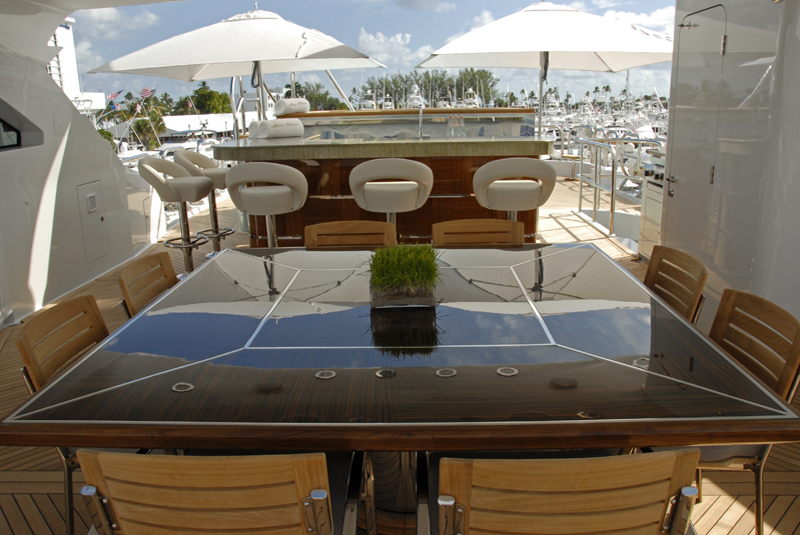 There is a wide variety of amenities including an expansive sundeck with a custom Spa Pool, full wet bar, sun pads, chaise lounges and a shaded table for casual dining. 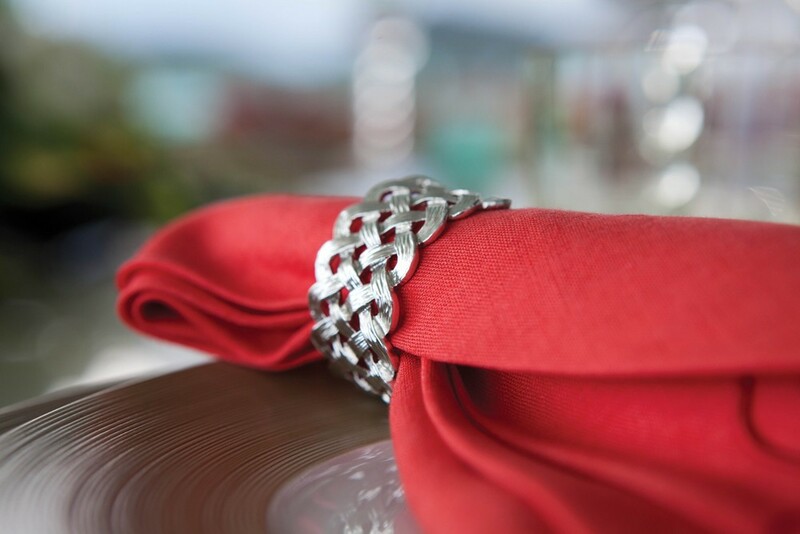 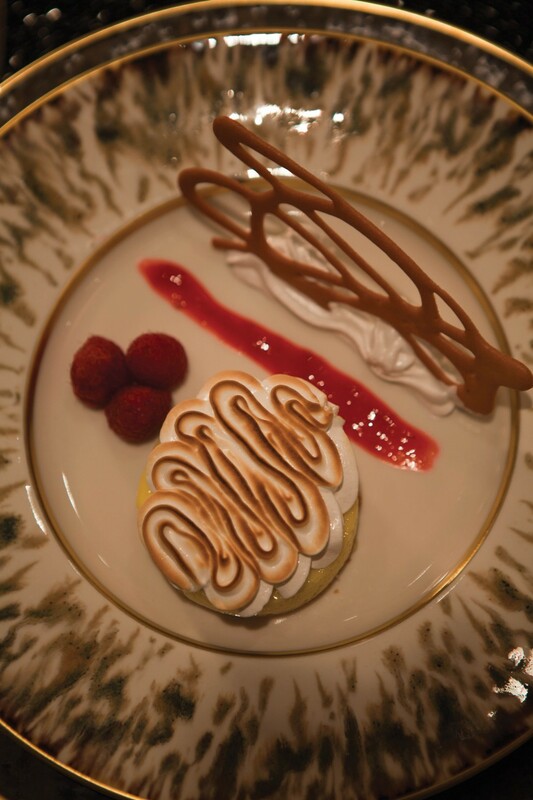 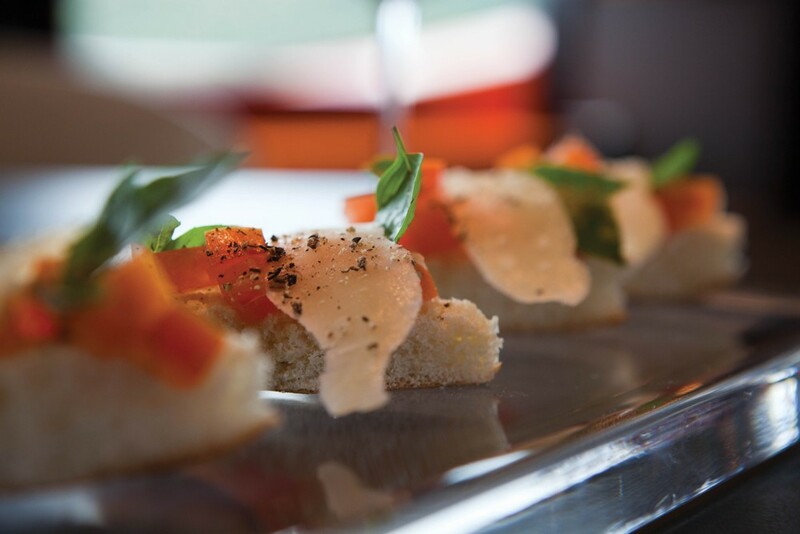 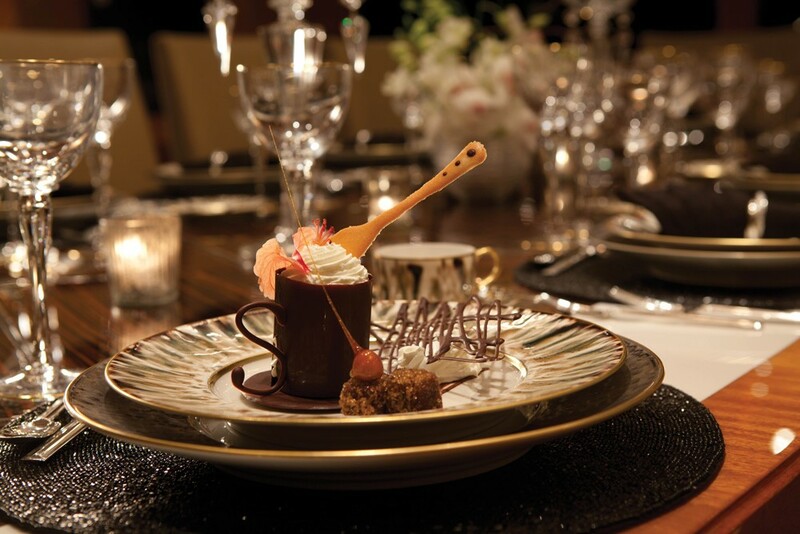 A five-star cuisine al-fresco is served on the sky lounge deck aft. 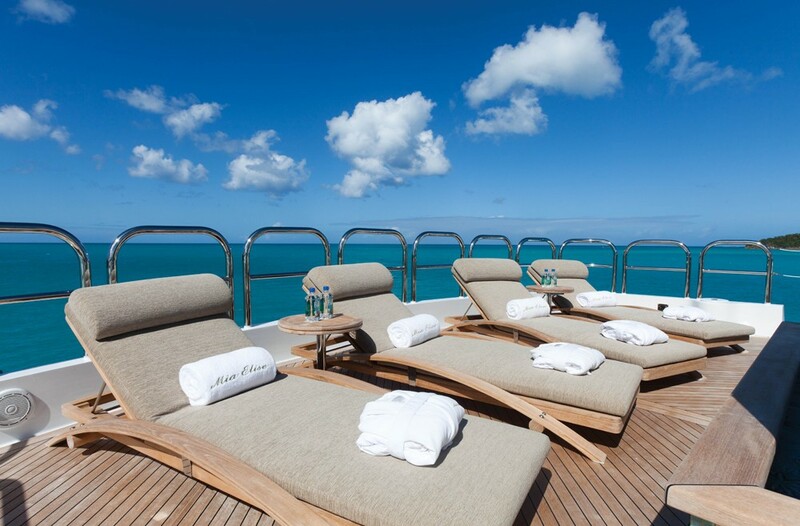 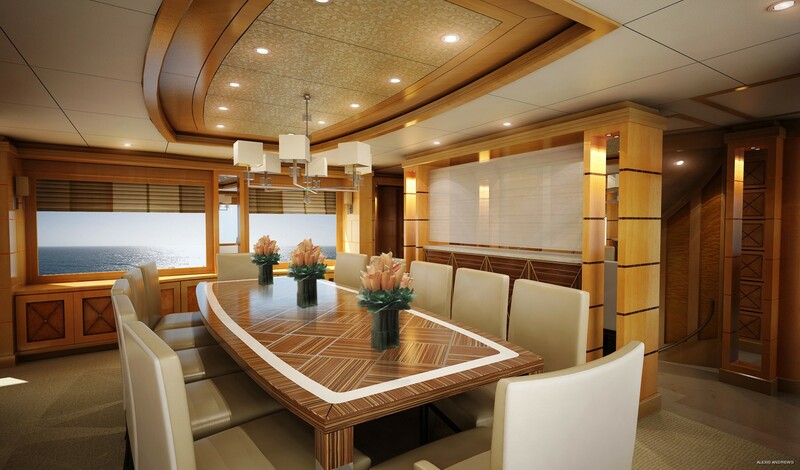 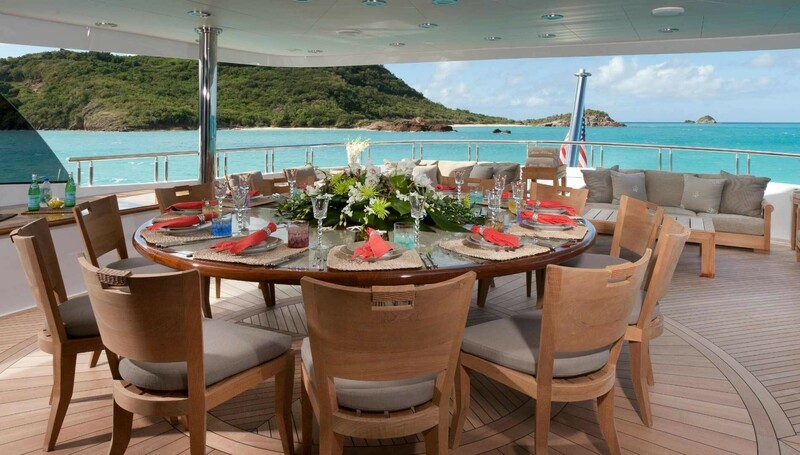 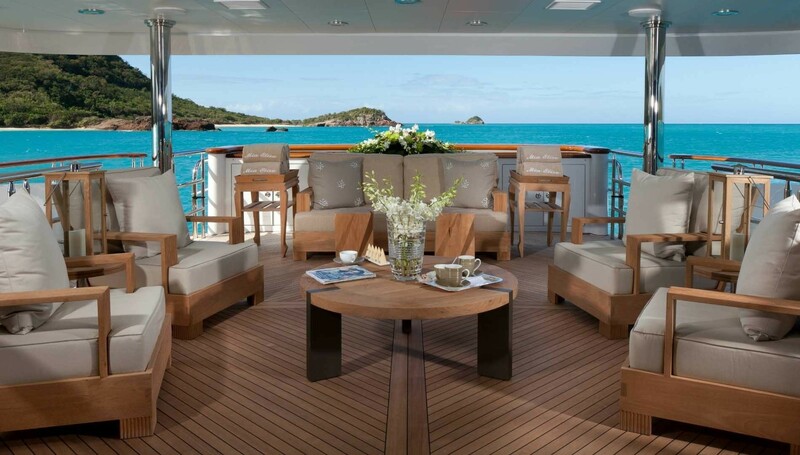 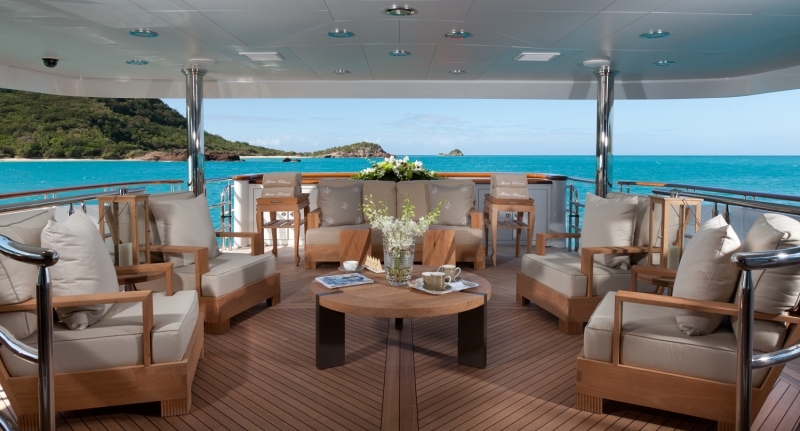 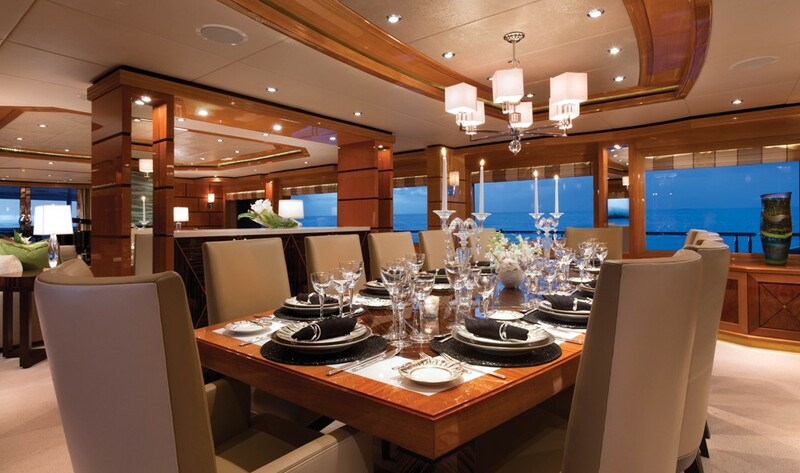 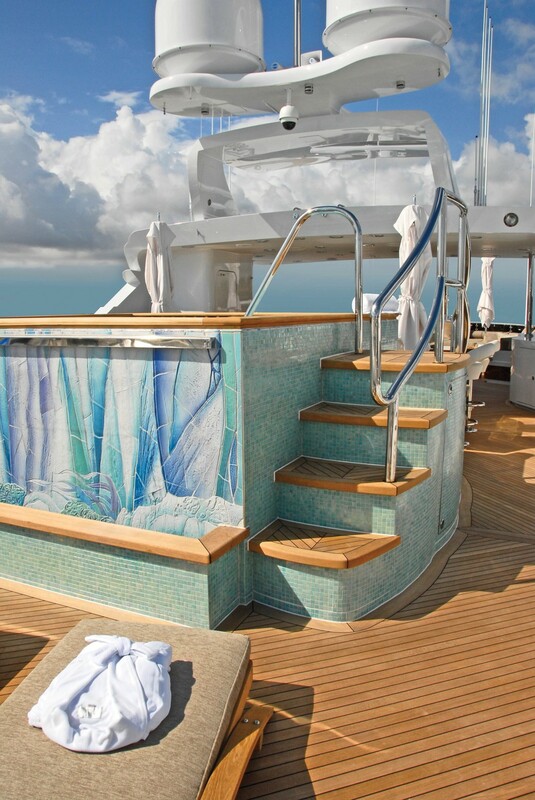 Guests can also enjoy private time on the main aft deck veranda. 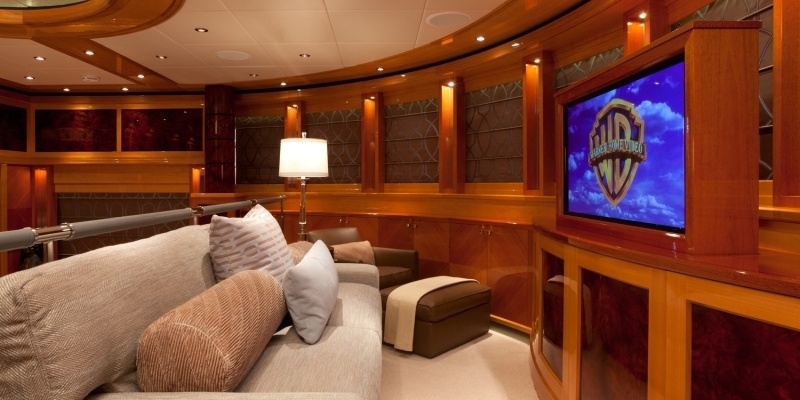 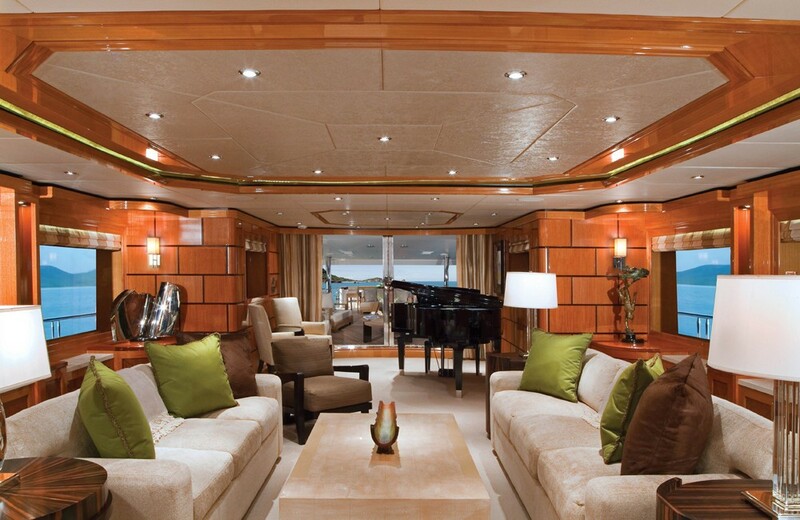 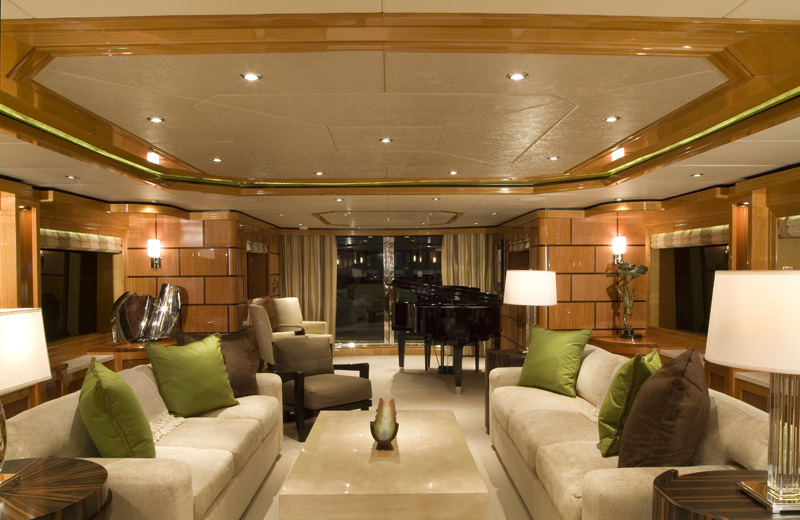 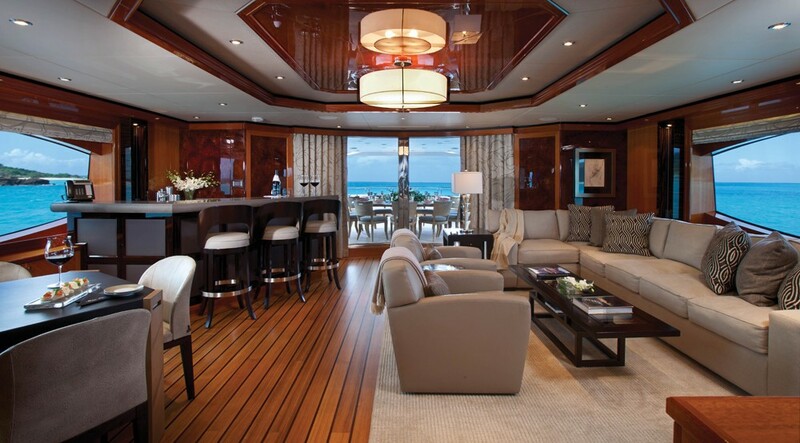 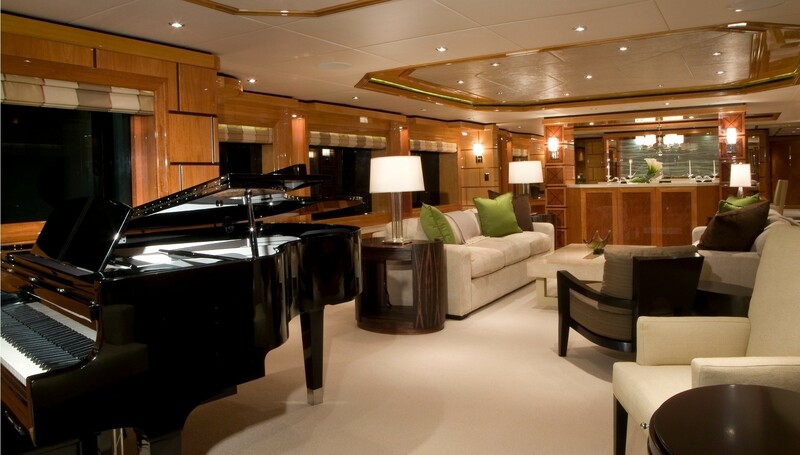 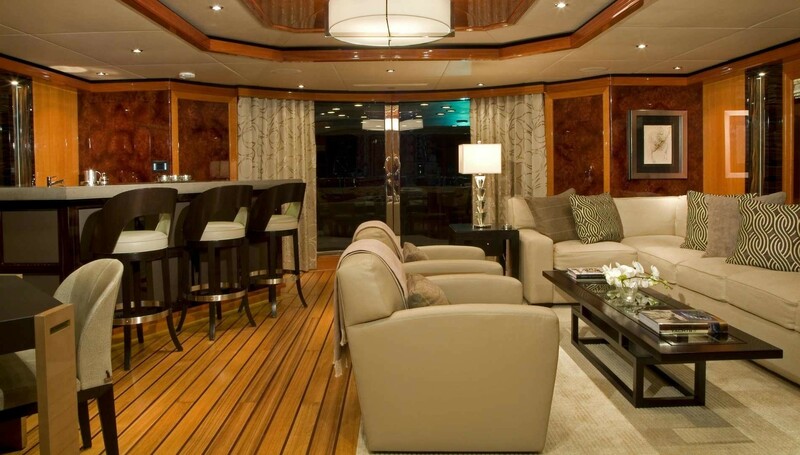 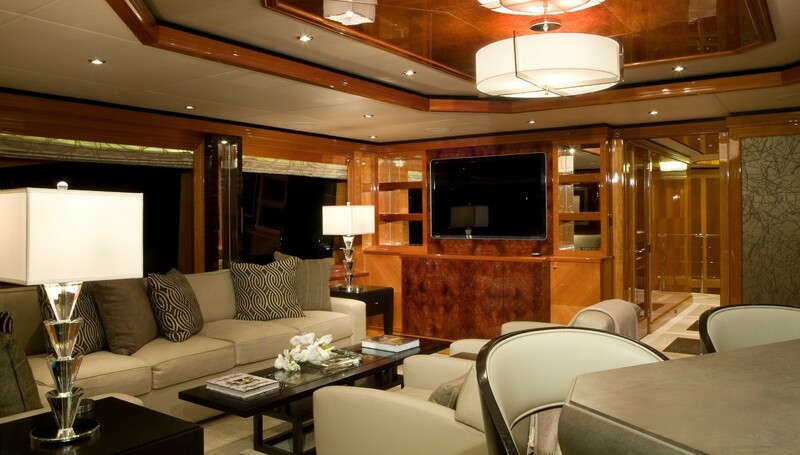 Motor yacht IMPROMPTU has a generous main salon with Salon 2 facing sofas and armchair and a 60 inch TV/DVD. 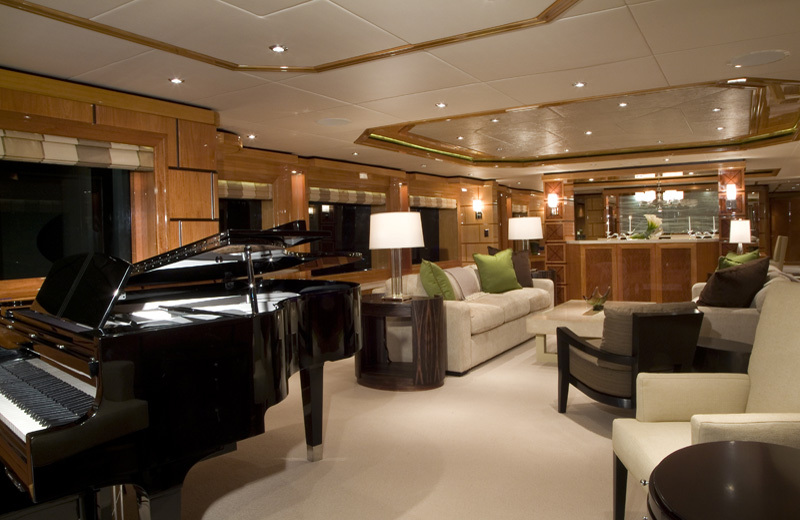 A Baby grand player piano along with 2 chairs are located aft and the formal dining area for up to 12 guests is located forward of the salon, separated by island credenza. 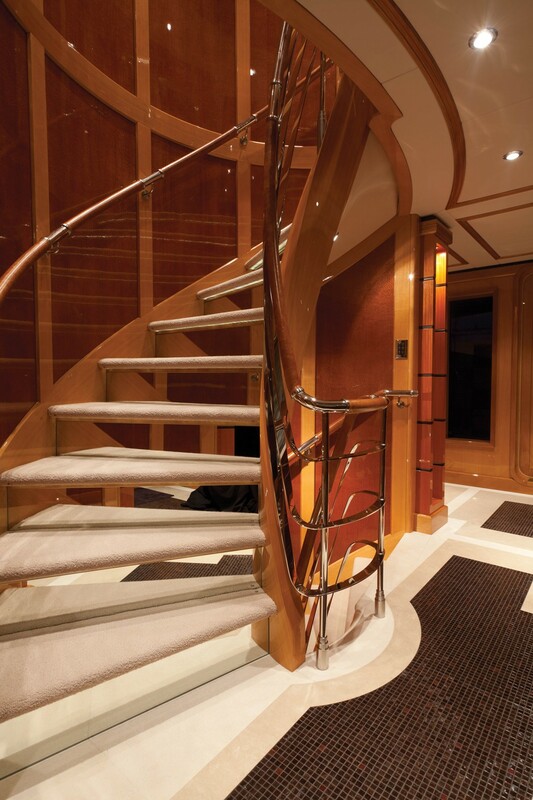 Walking forward on this level is a grand staircase and central walkway and a powder room off the foyer. 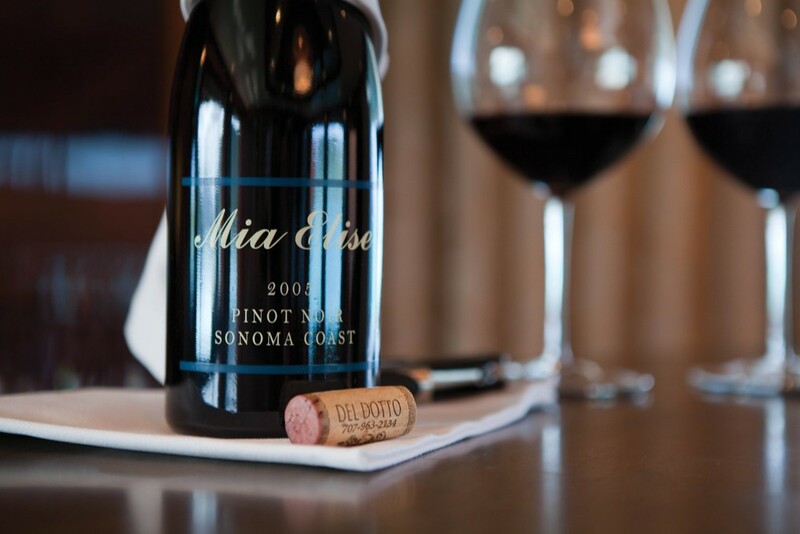 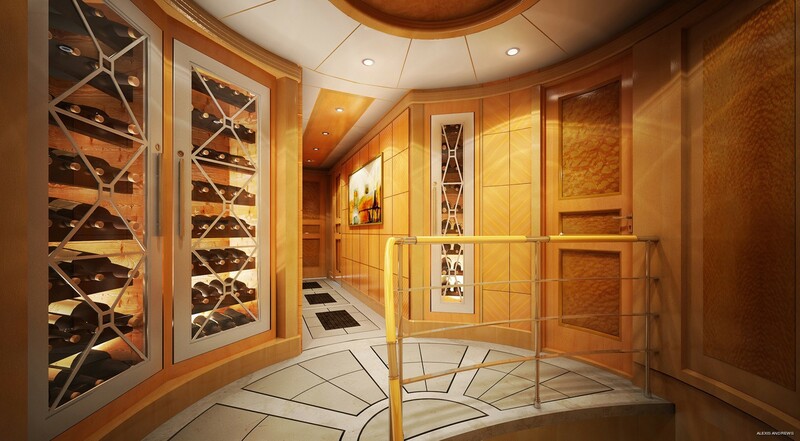 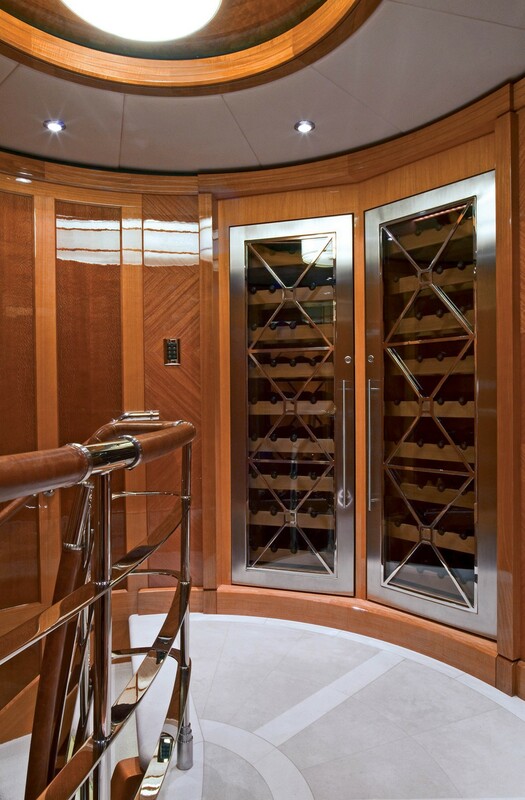 Up one level, the wine cellar on the bridge-deck landing makes for a warm entrance while also cooling and protecting precious cargo. 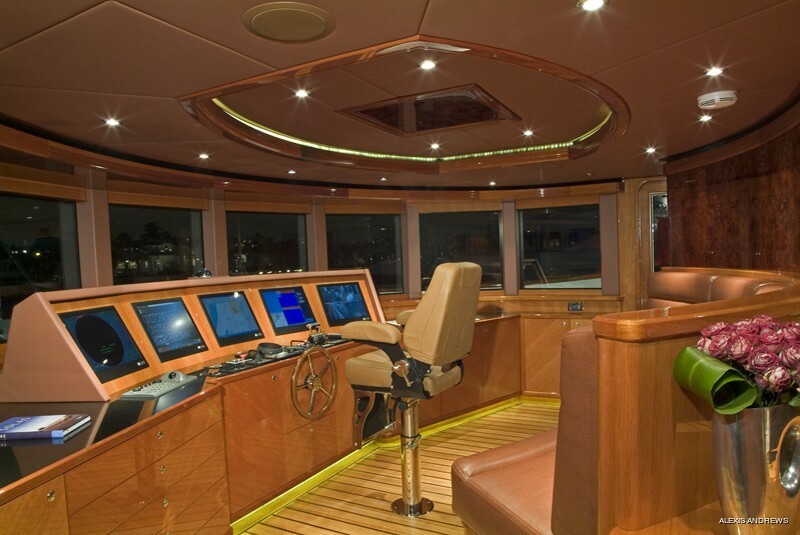 Aft of the impressive wheelhouse is the beautifully appointed sky lounge with a large L-shaped sofa to port and a Wet bar with 3 stools and game table. 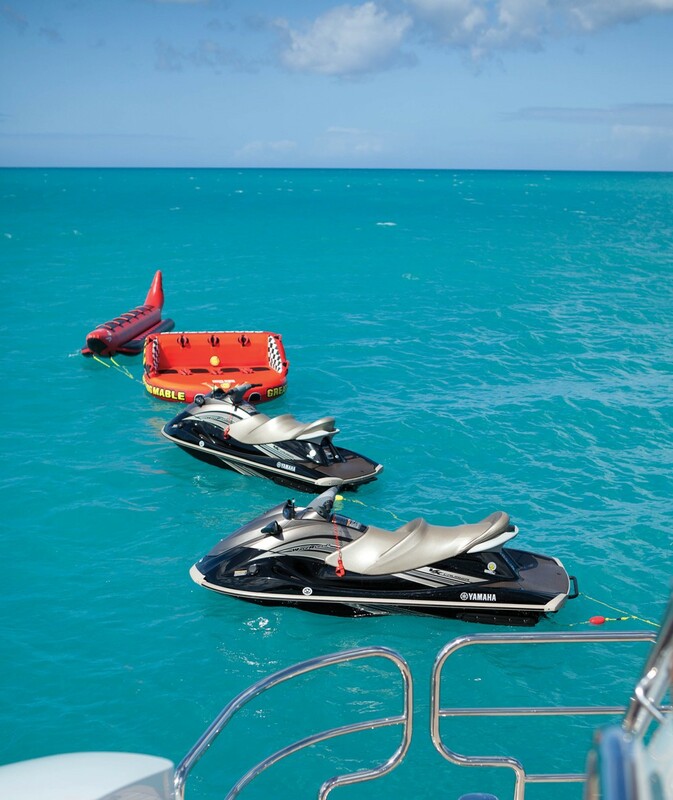 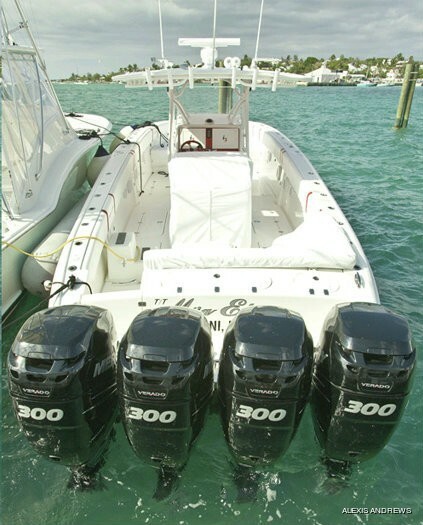 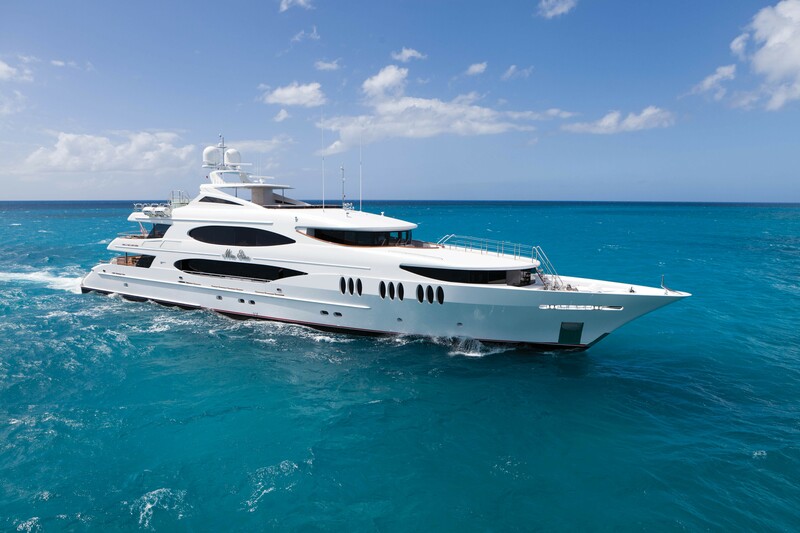 Yacht IMPROMPTU has a yacht tender garage stowing a 38-foot tender, WaveRunners, snorkelling and fishing gear and tow toys, and a fifth guest stateroom are situated on the pilothouse deck. 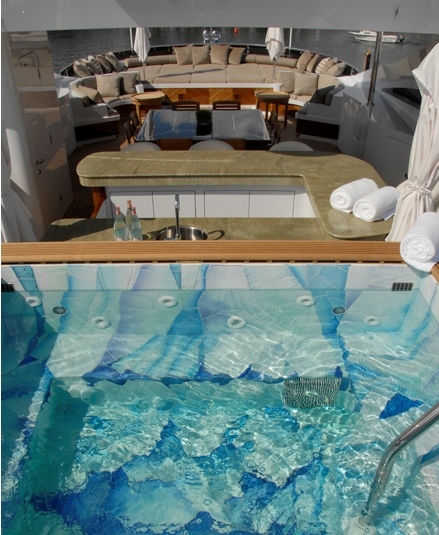 There is a raised seating area on the aft main deck and a huge hot tub on the aft flybridge. 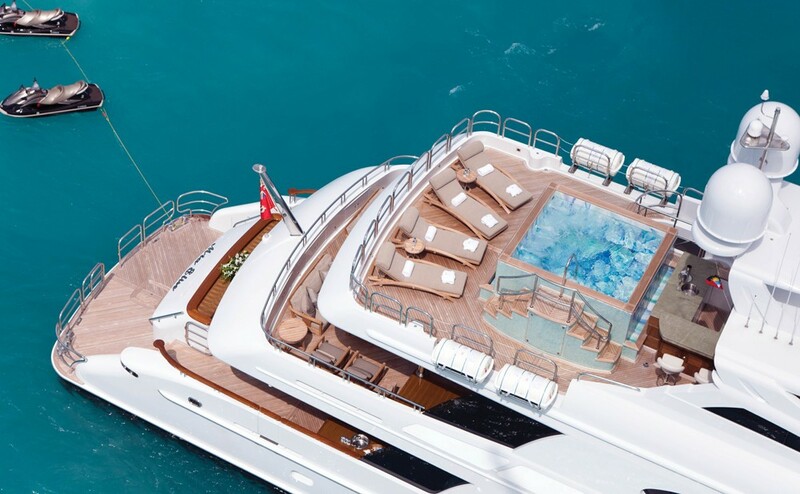 Run by twin Caterpillar 3512B diesel engines, a top speed of the luxury yacht IMPROMPTU is of 20 knots and her cruising speed is of 18 knots. 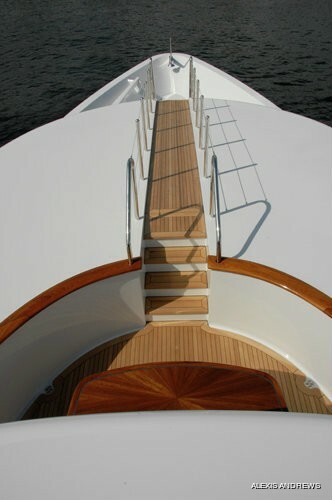 Her beam is of 8.5m (27'89") and her draught of 2.6m (8'53"). 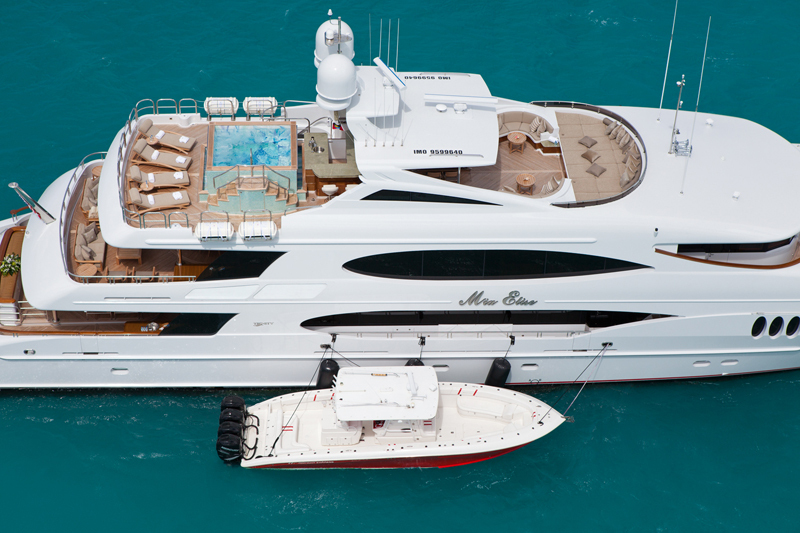 IMPROMPTU is classed to ABS and compliant to the MCA. 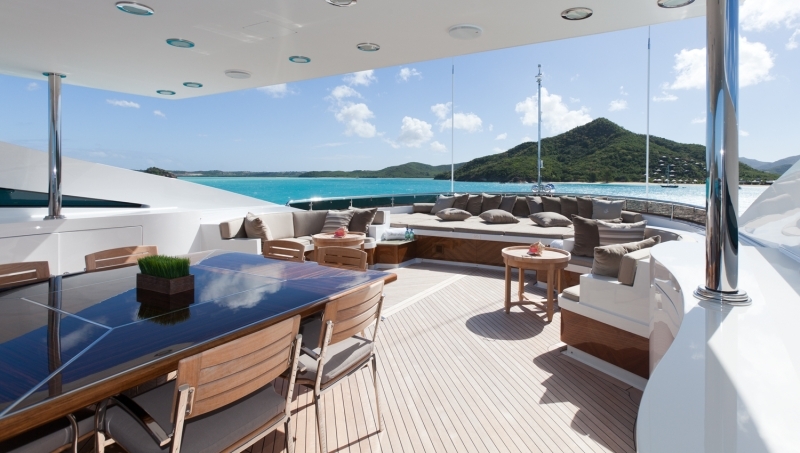 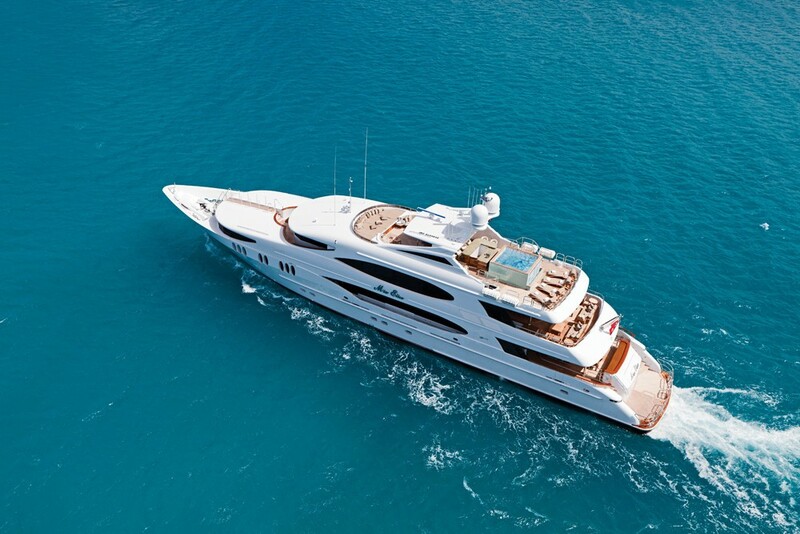 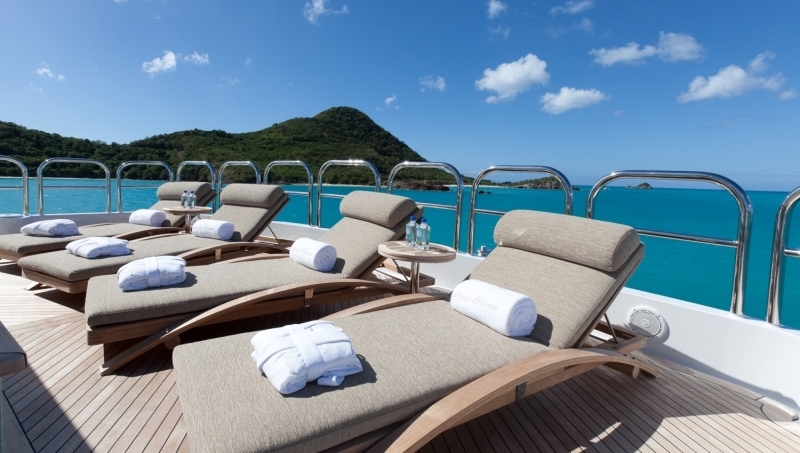 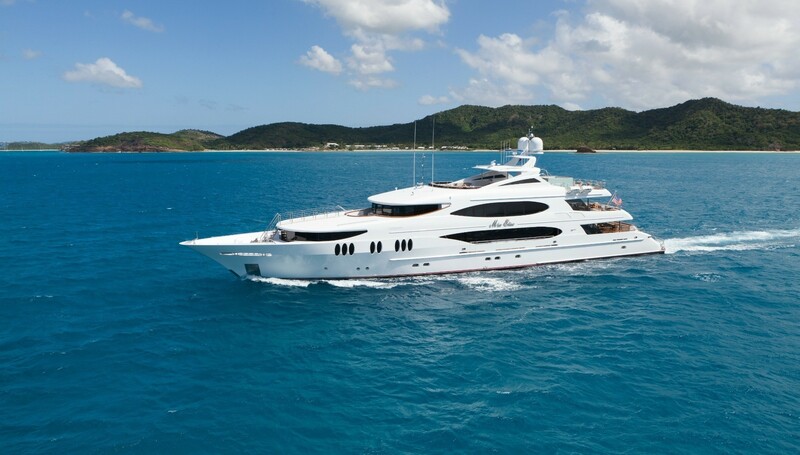 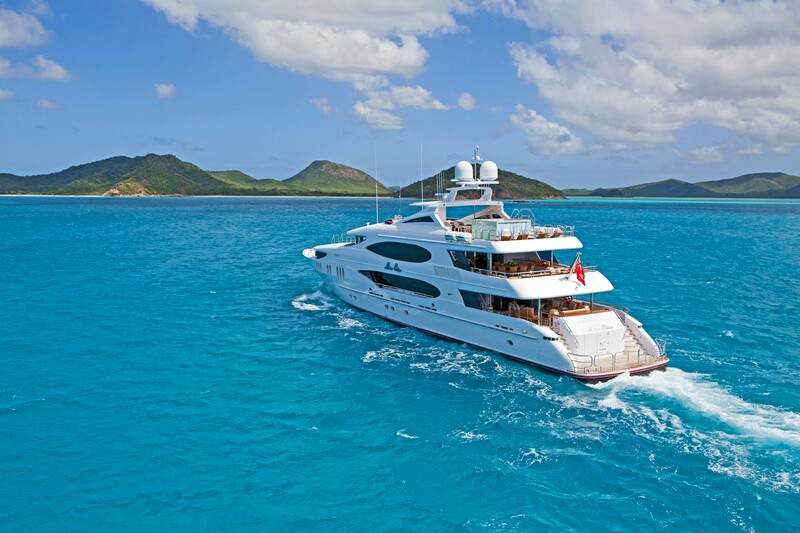 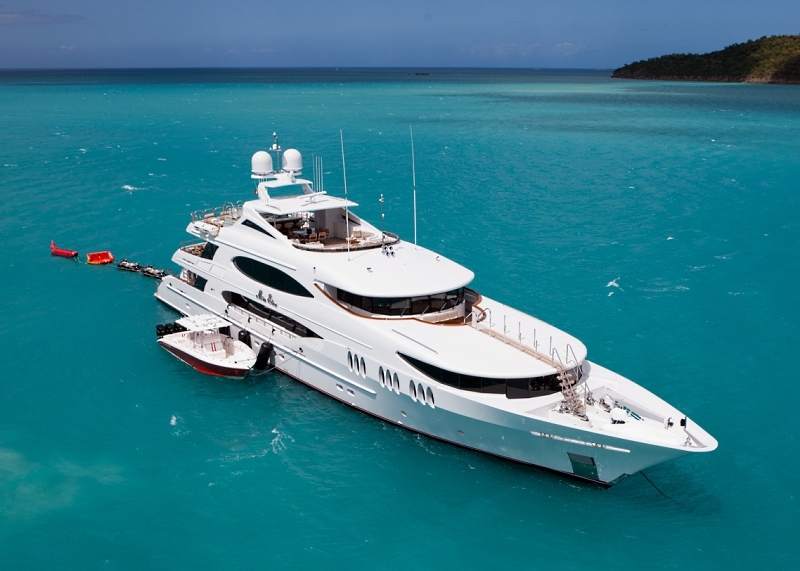 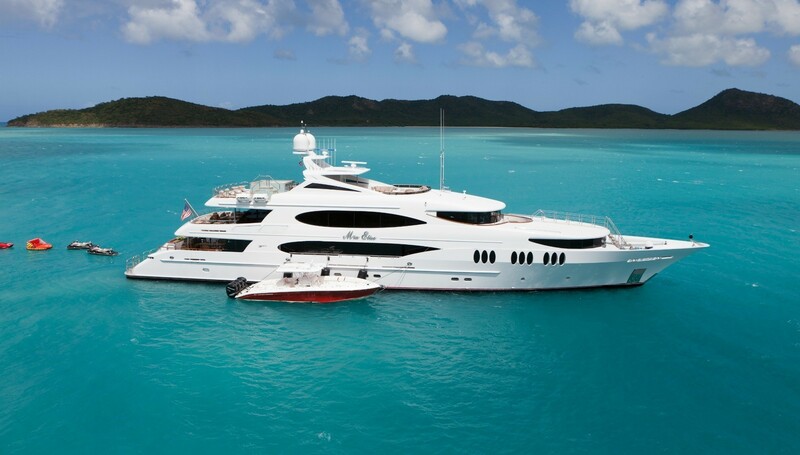 Trinity superyacht IMPROMPTU provides 12 charter guests with 6 beautiful staterooms. 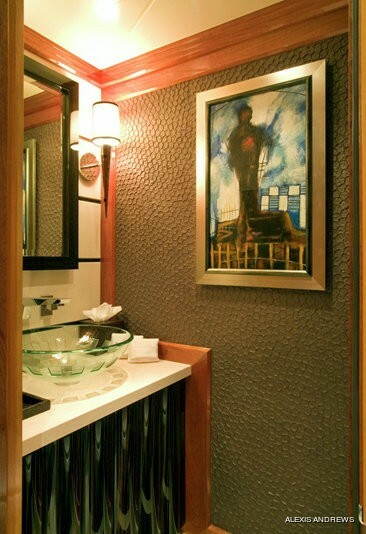 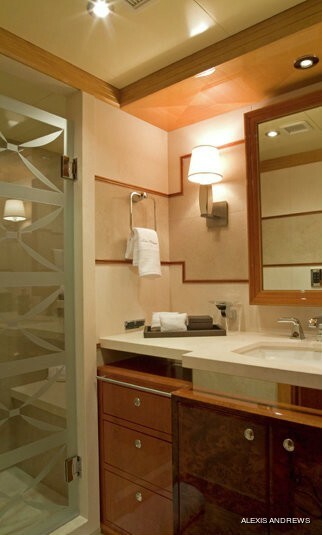 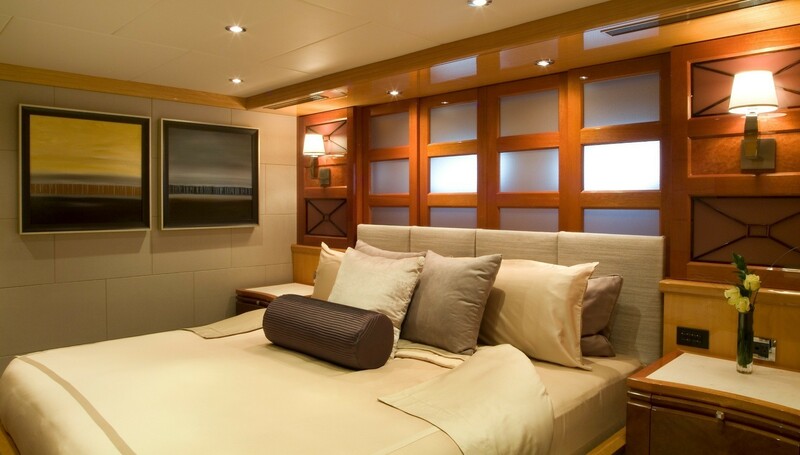 Each stateroom is en suite with cedar closet and TV/DVD. 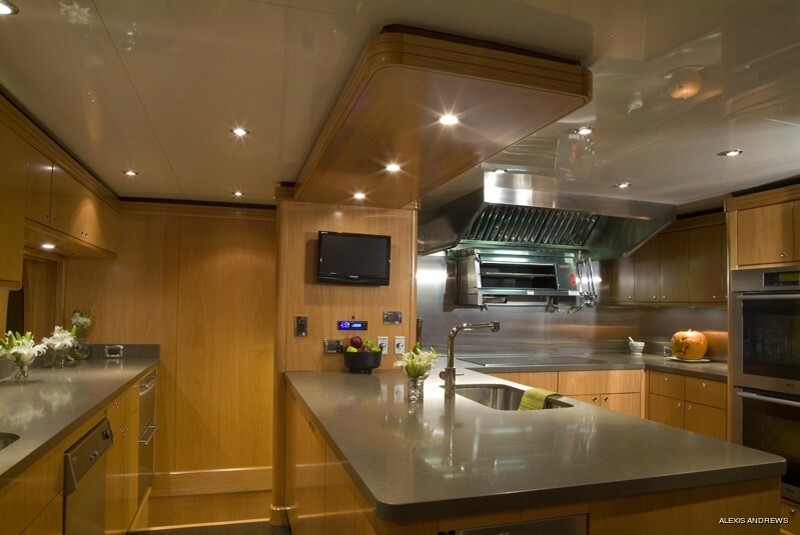 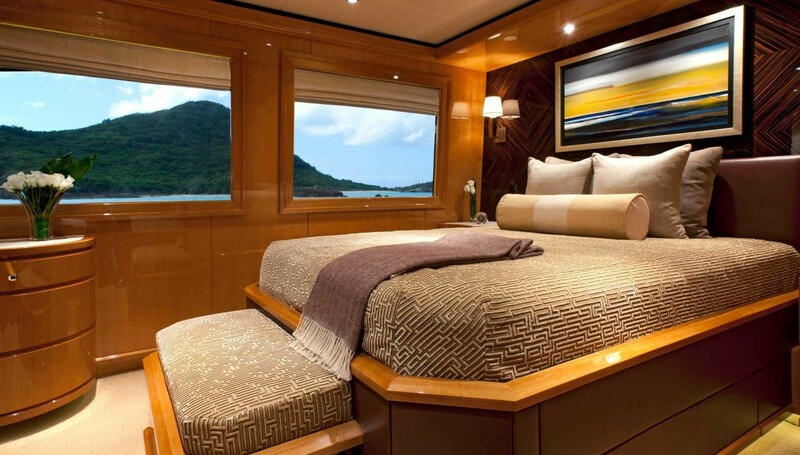 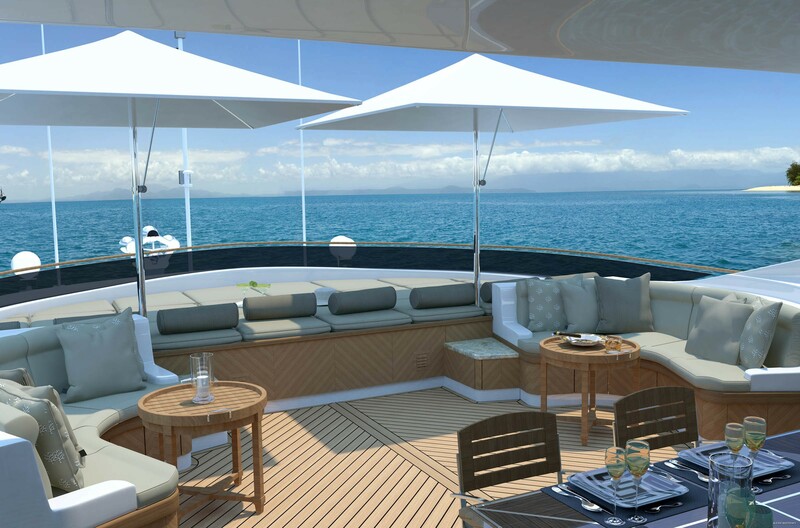 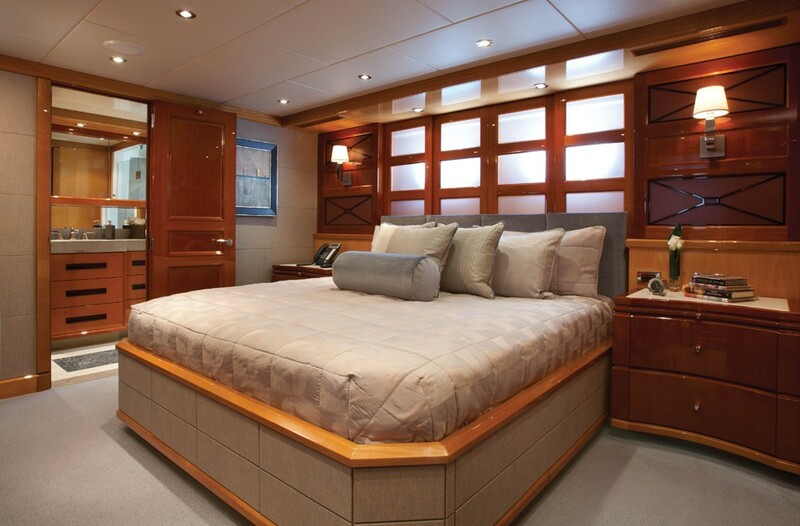 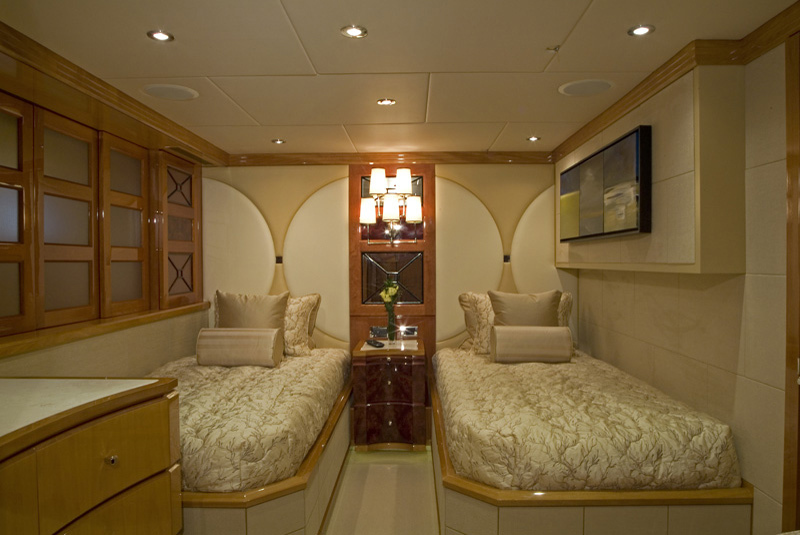 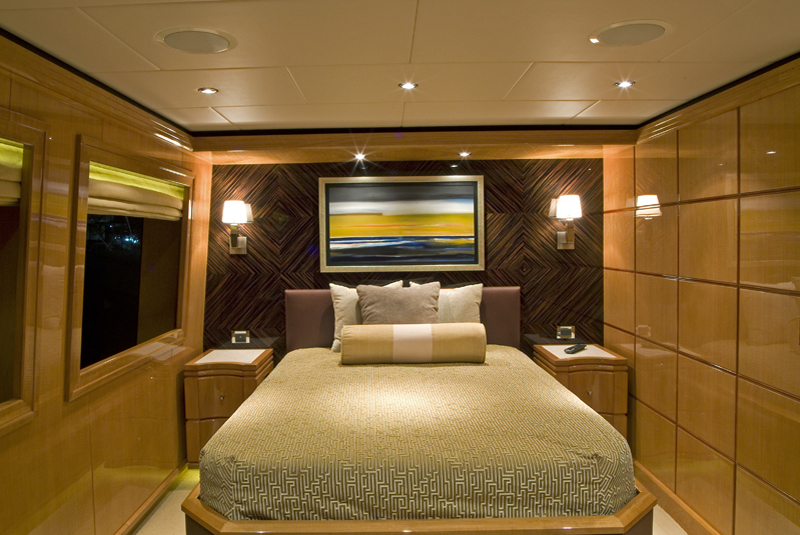 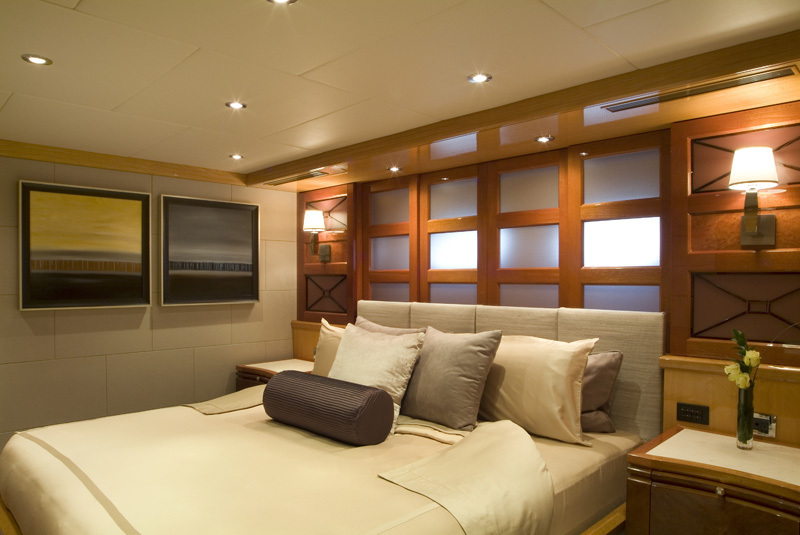 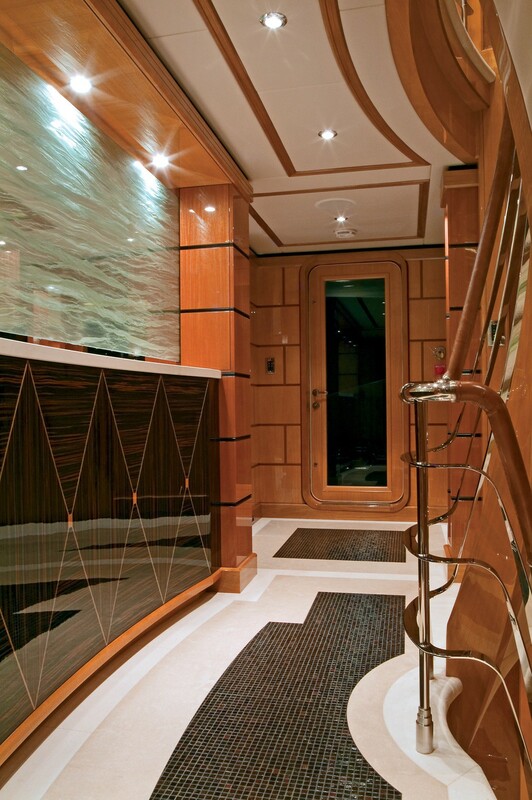 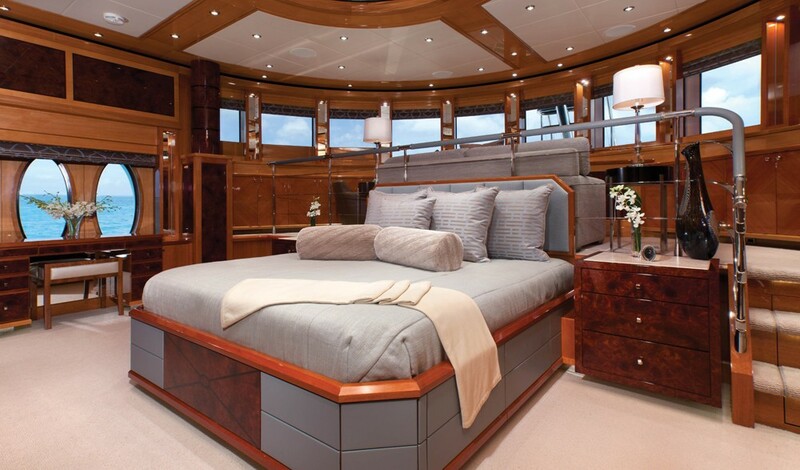 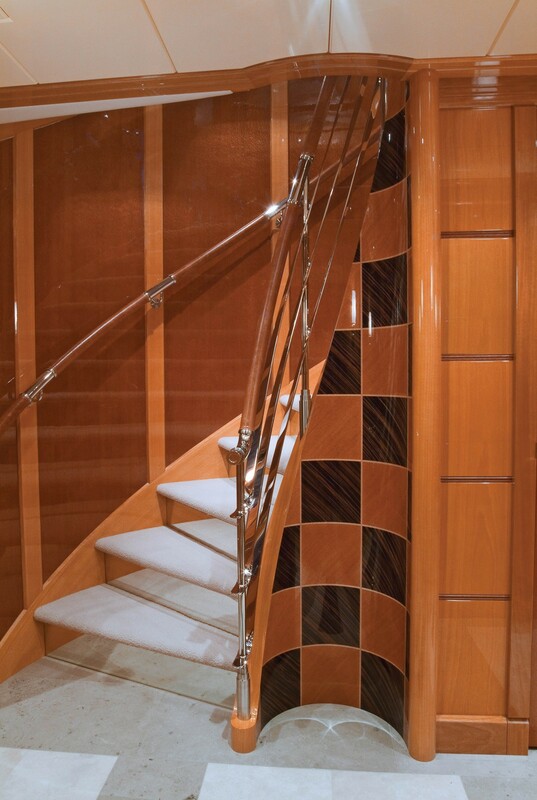 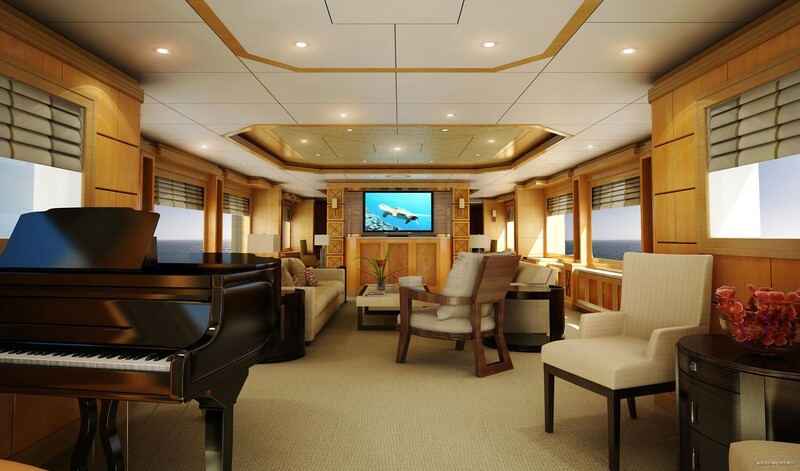 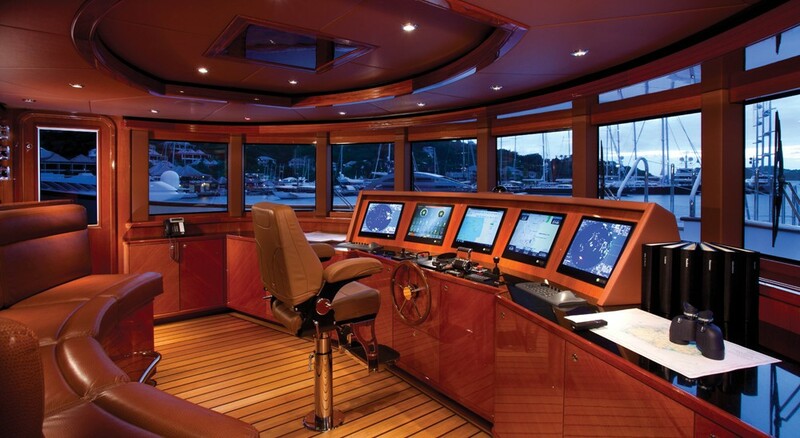 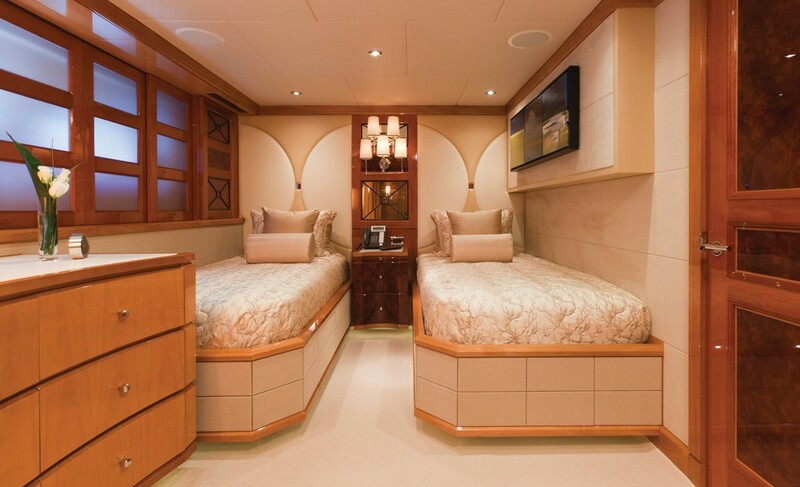 The master cabin is situated on the main deck, has a King bed and spans the full width of the yacht. 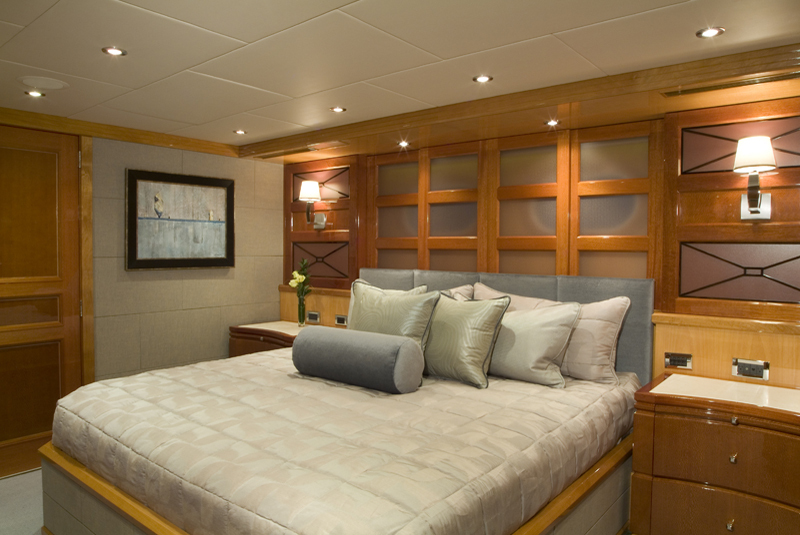 The Master suite is a split level design with a private lounge forward with sofa and chair. 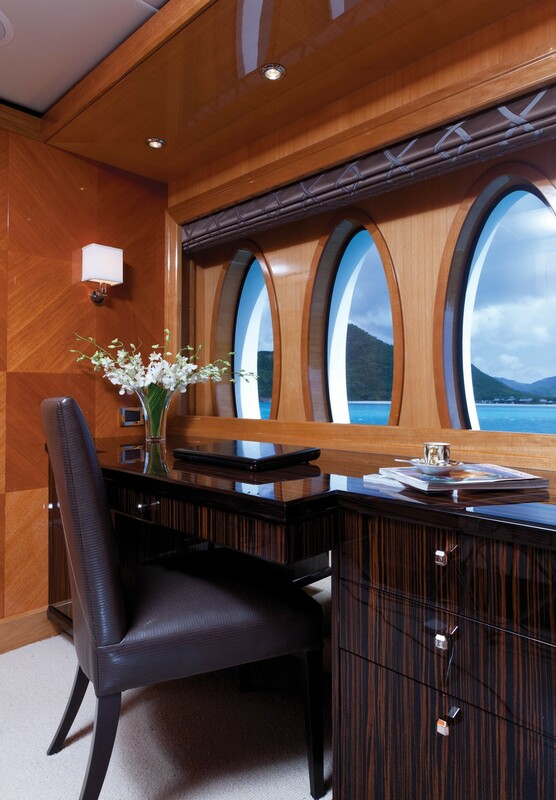 There is also a private study at entrance with desk. 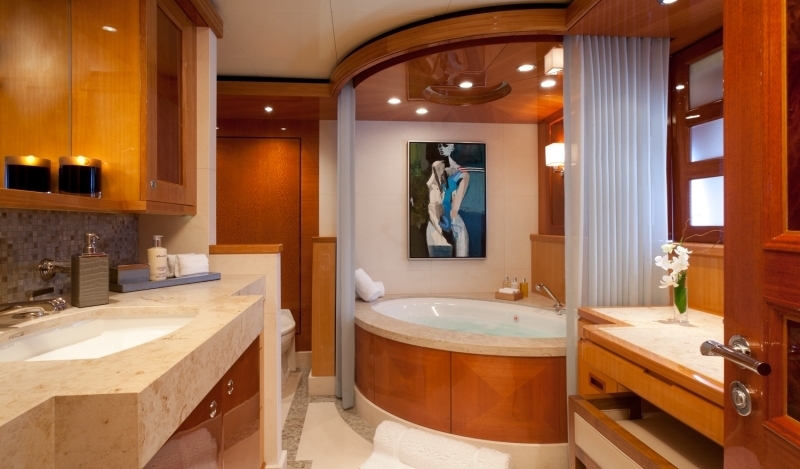 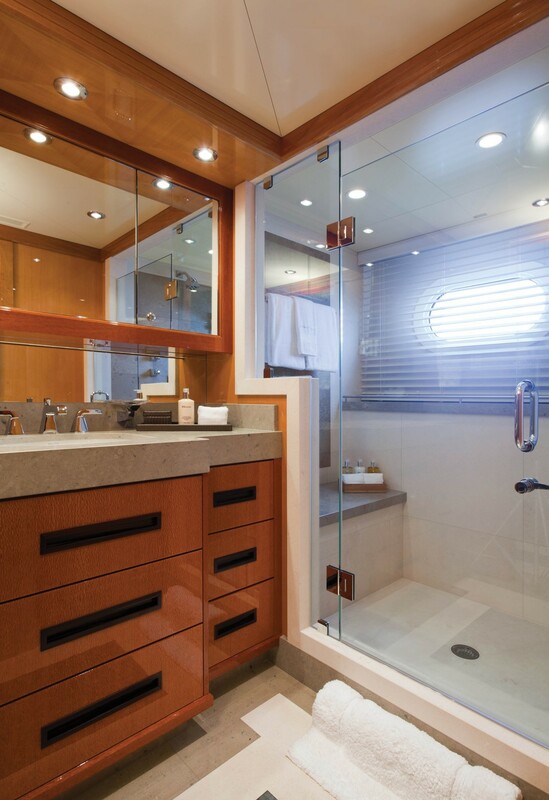 The beautiful His/hers bathrooms have a shower and Jacuzzi, vanity, walk-in closet adjacent. 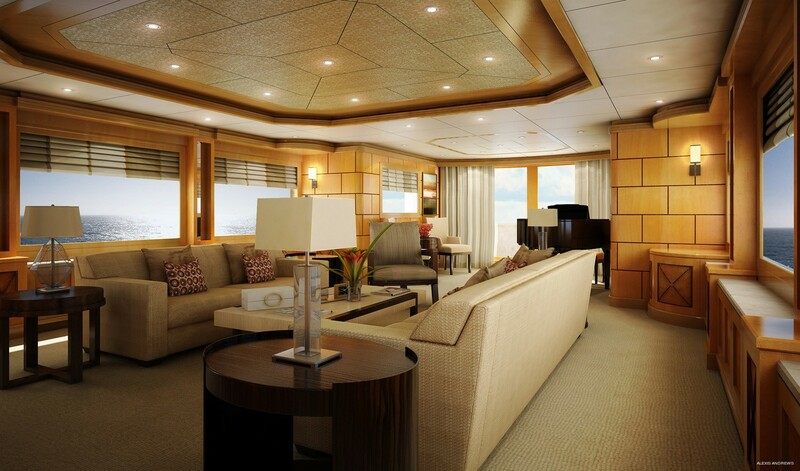 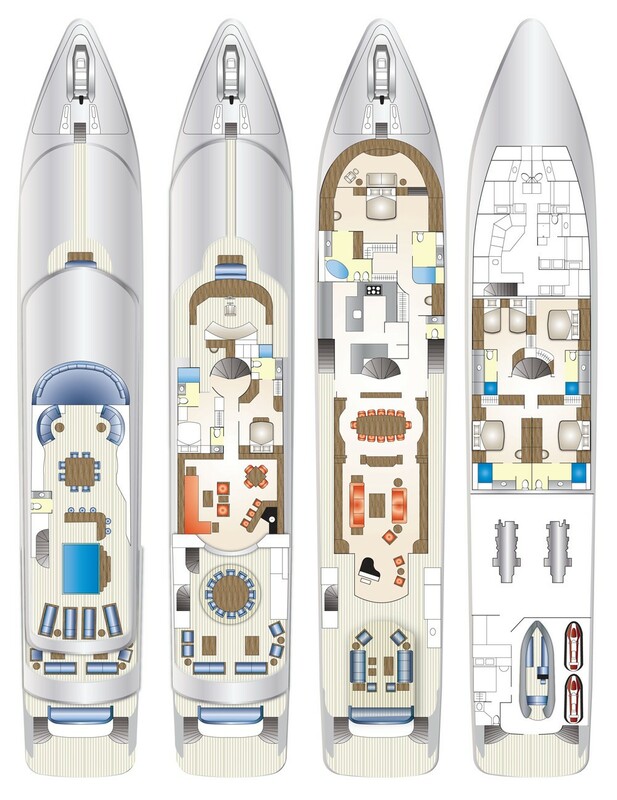 The remaining cabins include a Queen VIP cabin located on the Bridge deck aft of the wheelhouse, two King cabins located below amidships aft to port and starboard and further King and Twin cabin below amidships forward.